Mairead Farrell was 31 when she was assassinated by the SAS in Gibraltar Sunday March 6th 1988. Eyewitnesses described how she, Sean Savage and Dan McCann, members of an unarmed IRA unit, were shot without warning and were deliberately killed at close range as they lay wounded on the ground. The British media, with the exception of Thames TV’s “Death on the Rock, repeated the British Army propaganda that the three were armed and the local eyewitnesses were lying. There was also shock expressed at how a “woman like Mairead’ could have become involved with the IRA. To Mairead, however, her membership was a logical decision made as a result of a political analysis drawn from both personal experience and a study of Irish history. Mairead was born in Belfast on the 3rd August 1957; the second youngest of six children and the only girl. She was twelve when the British Army took over the streets of Belfast in 1969. Mairead found school work easy but left after taking her O-levels. Politics was an important issue in the Farrell household. Mairead listened to her grandfathers stories but it was her Belfast experiences that politicized her, “It was really more the events of those years growing up in the Falls we had to pass through the Brits during the curfews you could only get out for a certain number of hours. We were all victims of the British occupation really you just accepted that you would be involved to defend your country. 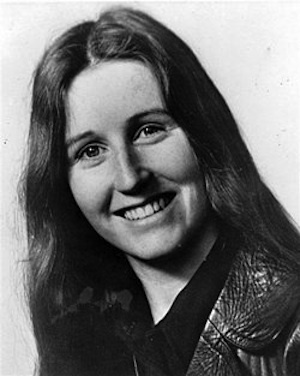 In 1976, Mairead was arrested after taking part in the IRA’s campaign. She was convicted of possession of explosives and membership of the IRA and sentenced to fourteen and a half years imprisonment. Mairead was sentenced at a crucial turning point in British policy and was to become the leader of the women in Armagh jail when the republican struggle was focused on the prisoners. In early April 1980 Mairead wrote to her relatives, “The stench of urine and excrement clings to the cells and our bodies. No longer can we empty the pots out the window as the male screws have boarded them up regardless of day or night, the cells are dark for 23 hours a day we lie in these celIs’ The protest lasted 13 months. It was to Mairead the most frightening time of her imprisonment. Women were locked in pairs in cells measuring 3m x 2m (9ft x 6ft). During this time, Mairead told Tim Pat Coogan, “We are in a war situation. We have been treated in a special way and tried in special courts because of the war and because of our political activities. We want to be regarded as prisoners of war. On 1st December 1980, Mairead, Mary Doyle and Mairead Nugent went on hunger strike in united action with the men in the Long Kesh ‘H Blocks. Afterwards she recalled how important was the support received from outside and also how she hated the distress caused to her parents. She continued on hunger strike until 19th December when it seemed the N.I.O. had agreed to the prisoners’ demands. This agreement was then retracted. In December 1982 strip searching was introduced at Armagh. The women republican prisoners refused to undergo these searches that were made before women were allowed out of the prison. Her last inter-prison visit to see her fiancee in Long Kesh was in October 1982 and she did not see him again until her release four years later. The remand prisoners suffered most from strip searching as they were searched before and after court hearings and were subject to regular beatings. The women republican prisoners ended their resistance to strip searching because of the fear of increasingly serious assaults. Mairead was strip searched on her release from Maghaberry Prison, “I felt it was the final insult. It’s designed as psychological torture, as a way of intimidating us.” Looking back on years in prison she saw them as teaching her the real values in life and making her more committed to her political beliefs.